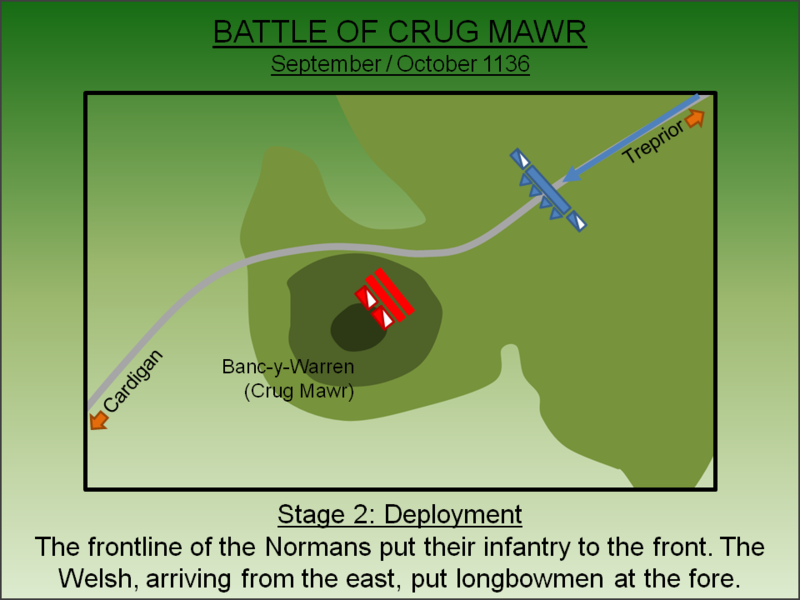 The Battle of Crug Mawr (1136), which is also known as the Battle of Cardigan, marked the arrival of the longbow into medieval warfare. 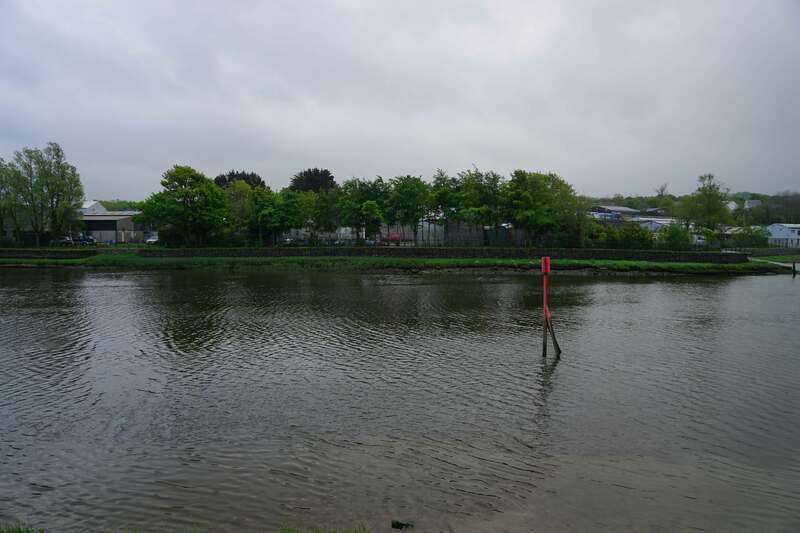 One of the largest battles fought on Welsh soil, it saw a Norman army decisively defeated in a set piece battle led by Owain ap Gruffudd, later Prince of Gwynedd. At the time of the Norman invasion of England, Wales was not a single political unit but was a collection of small Kingdoms which expanded and contracted dependent upon their individual rulers. As the Normans secured control of England, a number of baronial families - notably Braose, Clare and Mortimer - launched a piecemeal conquest of parts of Wales creating their own private Lordships. These so-called Marcher Lord were effectively the supreme rulers in their respective territories which lay beyond the normal framework of Royal authority. By the late eleventh/early twelfth century the Normans had established a strong presence in Pembroke and Gower and from there they were placing pressure on the Kingdom of Deheubarth. The territory was ruled by Gruffydd ap Rhys, King of Deheubarth who had sought to appease Norman ambition by marrying his daughter - the Princess Nest - to Gerald de Windsor, Constable of Pembroke Castle. However, in 1107 she was abducted by Owain ap Bleddyn, son of the ruler of Ceredigion. This prompted Henry I, who claimed overlordship of all Wales, to declare Ceredigion forfeit and authorised Gilbert fitz Richard de Clare to invade. In 1110 he duly did so building Cardigan Castle and Town. This new Norman outpost was situated on the frontier between the Norman controlled Pembrokeshire and the fiercely independent Welsh of Ceredigion. For the next twenty years an uneasy peace existed between the Normans and Ceredigion Welsh with the former sustaining their position through maintaining a large, well equipped military force in the region. However in 1135 Henry I of England died without leaving a male heir. Although his barons had pledged their support for his daughter, Matilda, upon the old King's death they switched their support to her cousin, Stephen of Blois. The Marcher Lords, including de Clare, shifted their focus to England prompting withdrawal of military forces from Wales. The Welsh seized the opportunity to expel the Normans. In January 1136 Hywell ap Maredudd raided the Gower peninsula, which was controlled by numerous Norman castles, and defeated the Normans at the Battle of Llwchwr. Informed of the uprising Gilbert fitz Richard de Clare returned to Wales intent at stabilising the situation but, on 15 April 1136, he was ambushed and killed at Coed Grwyne near Abergavenny. The death of the formidable de Clare prompted Gruffudd ap Cynan, Prince of Gwynedd to join the war. Too old to take part in hostilities himself, he sent his son - Owain ap Gruffudd - who marched south dislodging Norman settlers and attacking Aberystwyth Castle. By September Cardigan Castle was the only fortification still in Norman hands in Ceredigion. The Normans, seeing this as nothing short of an existential threat, mustered a large army at Cardigan in order to deal with the deteriorating military situation. A battle was now inevitable as the Welsh advanced on Cardigan with one of the largest armies ever raised by them planning to expel the invaders from Wales once and for all. The two armies were of comparable size but the Norman force included a large heavy cavalry component. This was regarded as the decisive tool for medieval battles for an organised charge which had built up momentum could simply smash an enemy infantry formation. Precisely who commanded the Norman army is unclear - some authors suggest it was Robert FitzMartin, Lord Cemmaes (from nearby Nevern Castle) whilst others claim Stephen de Mareis, Constable of Cardigan. Both men were certainly present on the battlefield. The Welsh army was led by Owain ap Gruffudd with various sub-commanders controlling their own men from their respective regions. Most of their troops lacked the extensive military skills of the Normans but a significant portion were armed with the longbow; a powerful weapon with accuracy and high penetrative power over long distances. The Welsh force also included a substantial cavalry component albeit of a very different nature from the Norman equivalent. The battle was fought in either September or October 1136. The precise date is generally regarded as unknown although one author, Johnson, cites Saturday 10 October 1136. The Normans had mustered their army at Cardigan Castle and were doubtless confident they could defeat the Welsh. They had a large balanced force that represented the pinnacle of military forces of the era. When intelligence was received that a large Welsh army was approaching from Aberystwyth, the Normans marched out of the castle and advanced along a road that is today followed by the A487. The Normans deployed on the slopes of Banc-y-Warren (then known as Crug Mawr) commanding the road to Cardigan. They configured the army in three formations with the Flemish mercenaries - the best troops - in the frontline with the Norman infantry in reserve. The cavalry was held in the rear. 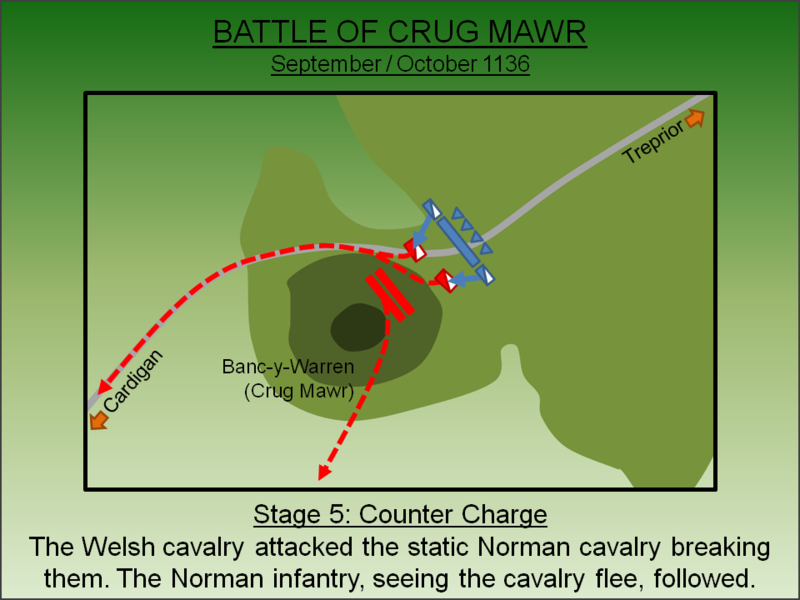 The Norman intent was to allow the Welsh to launch an uphill assault against the Flemings, who would doubtless repulse them, and then use a cavalry charge to rout the Welsh force. Owain ap Gruffudd advanced from the east and, having sighted the Norman army, deployed his army with infantry in the centre and his cavalry force on the flanks. He put his longbowmen in the frontline of the infantry with his more experienced soldiers, predominantly those from Gwynedd, in the rear. 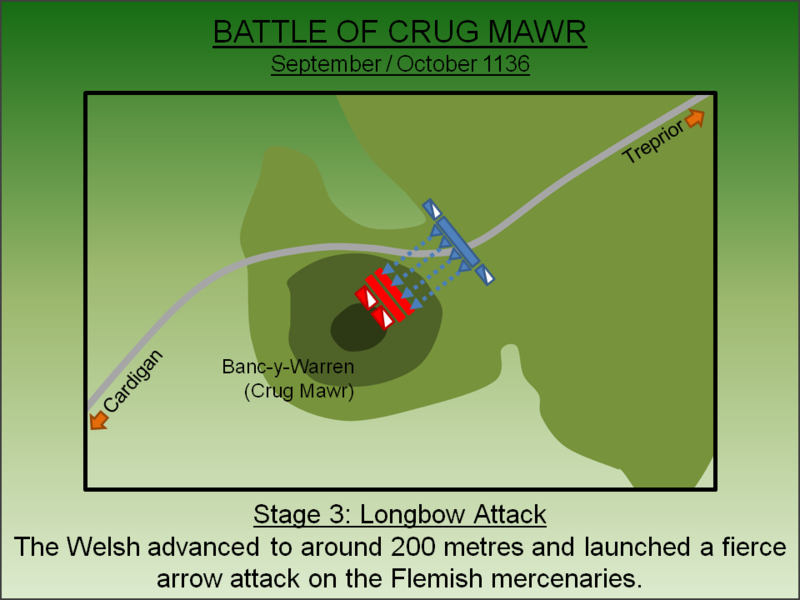 The Welsh infantry advanced and launched an intense longbow attack on the Flemish lines at a range of around 200 metres. The formidable power of the bow cut through the armour of the well equipped mercenaries and casualties started to mount. As gaps appeared in the Flemish lines, the Normans sent forward troops from their infantry reserve. However many were unarmoured and suffered very heavily from the arrow assault. Concerned the infantry was on the cusp of breaking, the Norman leadership launched a cavalry charge against the Welsh. However the Longbowmen now simply switched target to the advancing mass of cavalry. The assault stalled the Norman attack and by the time they reached the Welsh frontline they had lost momentum. The Welsh longbowmen prudently retreated behind the infantry line as the Norman cavalry approached and the latter, having lost all speed, were unable to break the Gwynedd infantry. 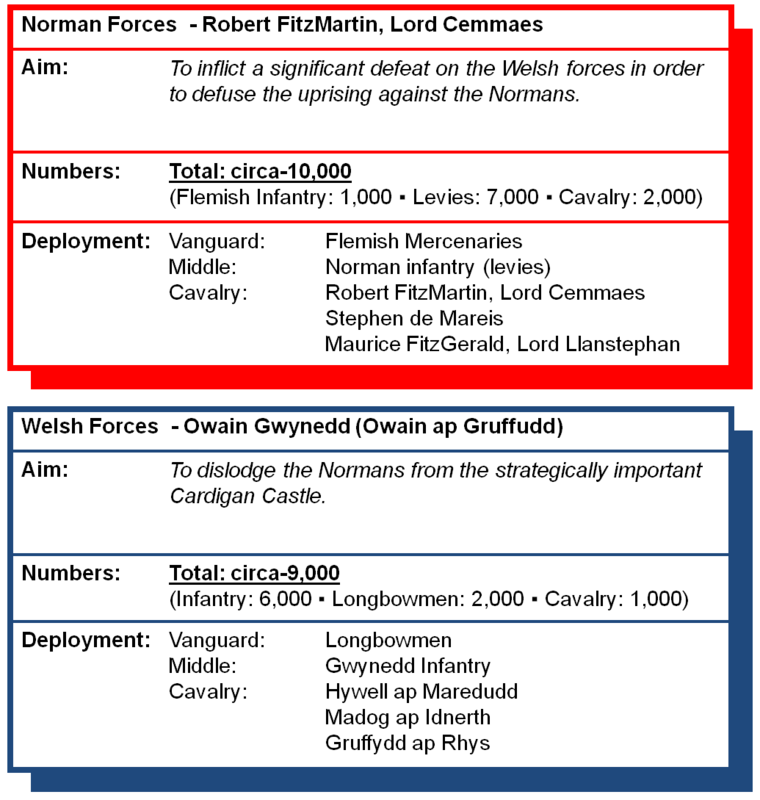 The Welsh cavalry now charged against their Norman opponents and broke them. The Normans' cavalry fled back down the road towards Cardigan. Having seen their cavalry break, order in the Norman infantry broke down and the entire army started to retreat. 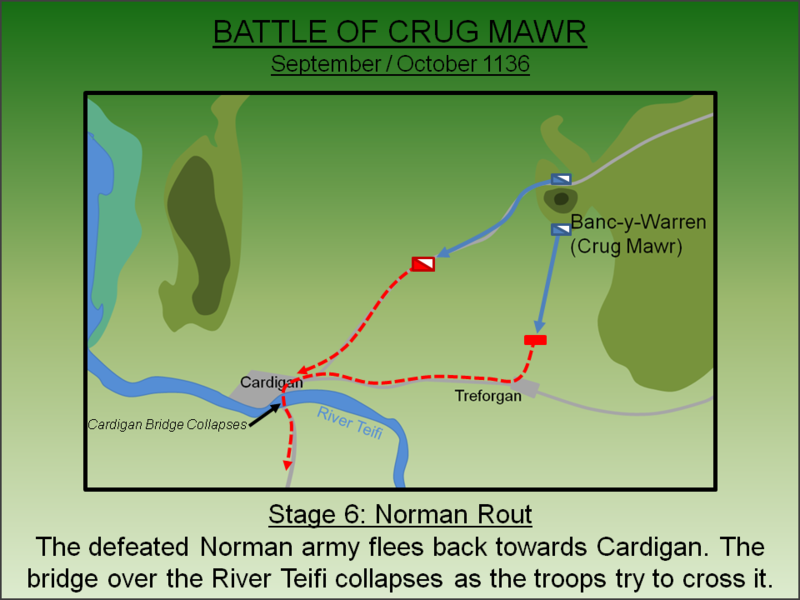 The troops fled back towards Cardigan pursued by the Welsh cavalry. Those that made it to the town attempted to cross the bridge over the River Teifi but, under the weight of hundreds of armoured men, it collapsed. Stranded on the other side, some troops stripped off their armour and swam across but many were trapped and slaughtered by the Welsh. 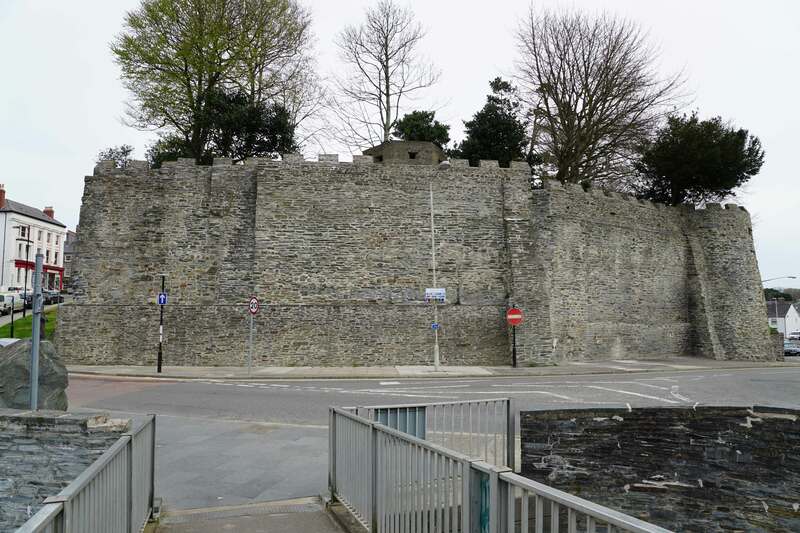 Stephen de Mareis successfully made it back to Cardigan Castle and the strong defences of that outpost ensured it did not fall to the Welsh. However, in all other aspects the battle was a disaster for the Normans. Their army in Wales had been destroyed as an effective fighting force. Perhaps as many as 3,000 men had been killed whilst the remainder were demoralised and had abandoned much of their equipment either on the battlefield or as they crossed the River Tiefi. Longer term the battle significantly enhanced the reputation of Owain ap Gruffudd, who inherited his father's title of Prince of Gwynedd in 1137, and for the next 20 years the native Welsh held the military initiative resulting in a period of contraction of Norman influence. Johnson, G.K (2014). Cardigan Castle: A History. The Teifi Estuary History Man. Lancaster, J.H.D (2016). 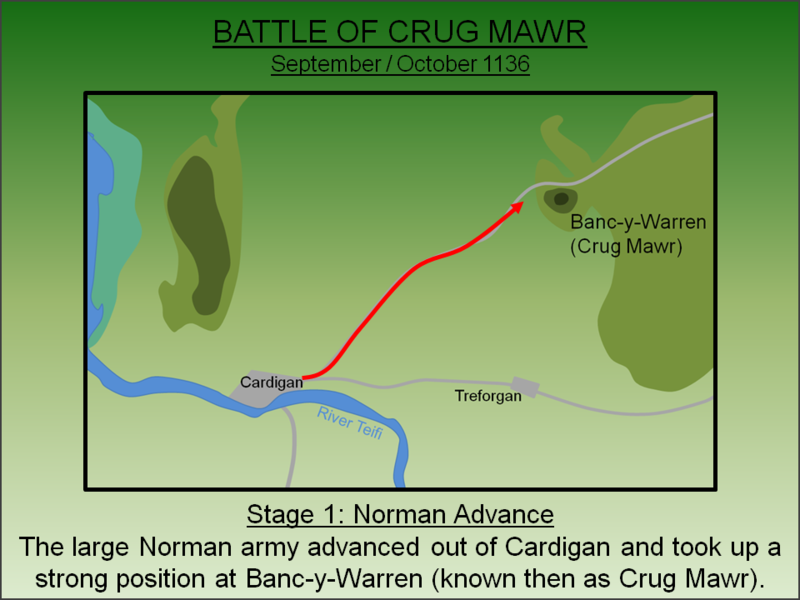 Crug Mawr and Cardigan: Battlefield visit notes and observations. CastlesFortsBattles.co.uk. Ordnance Survey (2016). Ceredigion, Penparc. Scale 1:1250. Southampton. There is no monument and the hill itself is private land with no public access. Nevertheless the terrain can be appreciated from the main road and a number of public footpaths that cross the area. Cardigan Castle is a major tourist attraction. Cardigan Castle. The castle had been established by the de Clare family in 1110. At the time of the battle the defences would have been timber but it was nevertheless a formidable fortress. The Normans deployed from here to fight the battle. Crug Mawr. 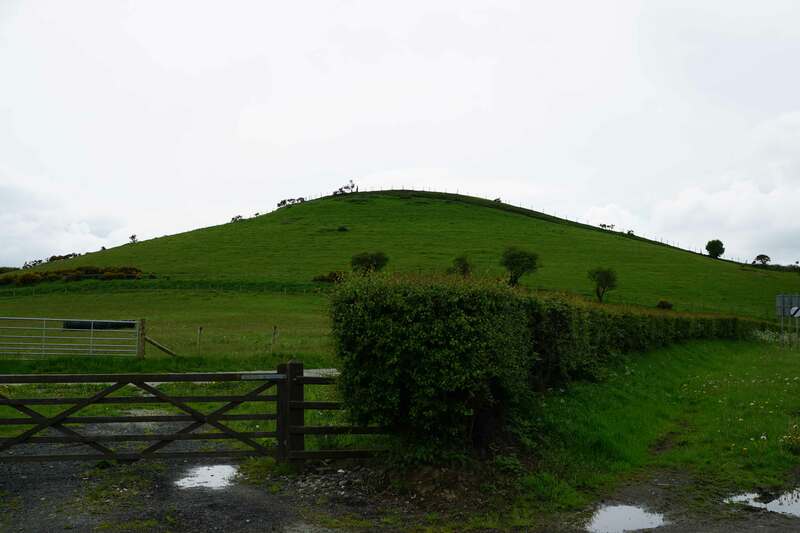 The dominant hill, which is now known as Banc-y-Warren, would have been well known to the Norman commanders. Then, as now, it dominated the road to Aberystwyth. Crug Mawr. 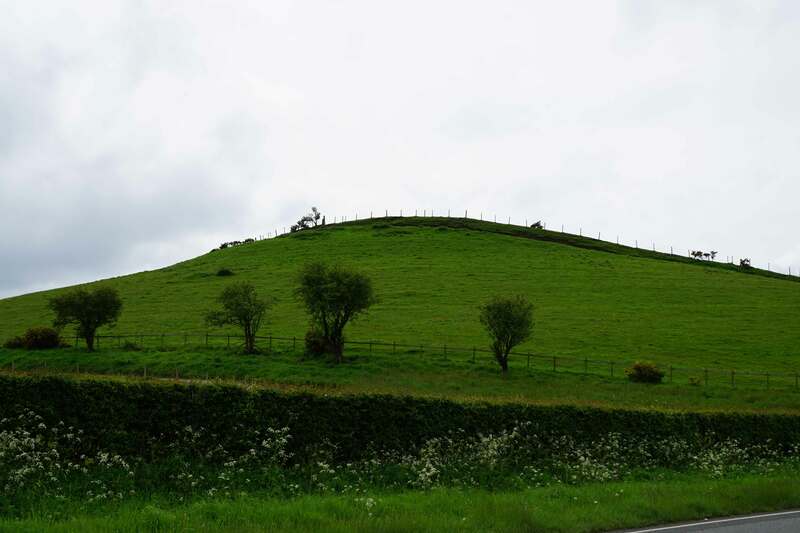 The Normans positioned their cavalry near the summit whilst the infantry was on the lower slopes. Gloster Row. 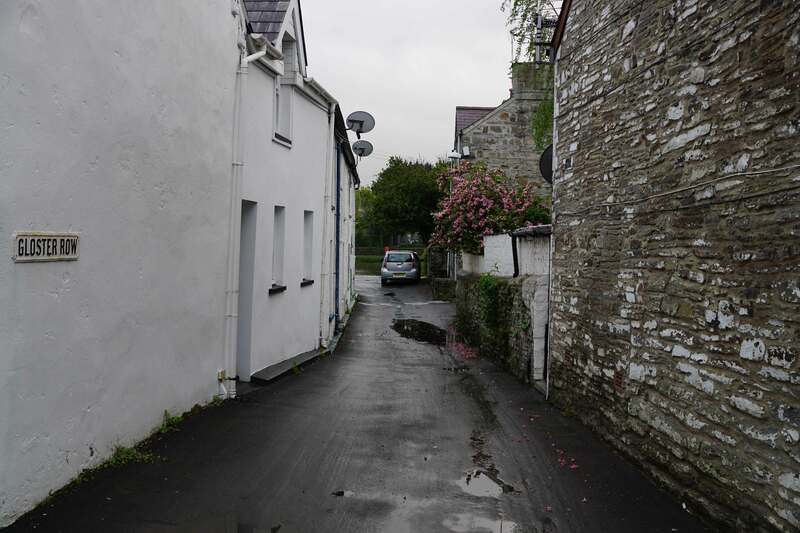 The narrow lane of Gloster Row was the main access to the bridge. The retreating Normans fled down this lane as they attempted to escape. Site of Bridge. Today the bridge is in front of Cardigan Castle but in 1136 it was further upstream. 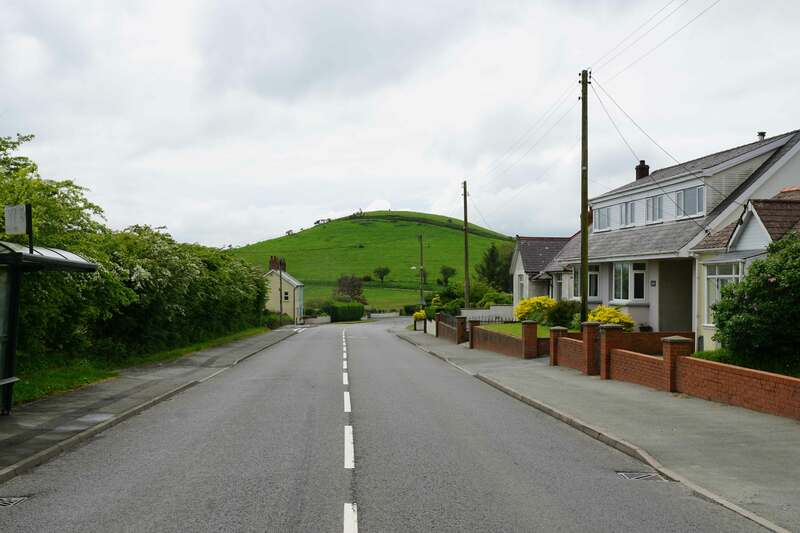 Crug Mawr (now called Banc-y-Warren) can be found in the village of Penparc on the A487. On-road car parking is possible on many of the adjacent roads.